The Sure Scrape Mat is a tough, industrial-grade product ensured to help keep your floors clean and dry, while reducing time and money spent on maintenance. This mat is constructed with a heavy-duty, long-wearing SBR/Nitrile combination. It effectively scrapes debris, snow and rain off shoes, containing it within the mat. Molded, beveled edges on all four sides help protect floors and carpets by holding in moisture and debris. The one-step mold design ensures scrapers will not tear or loosen, enhancing the safety features and reducing slipping hazards. 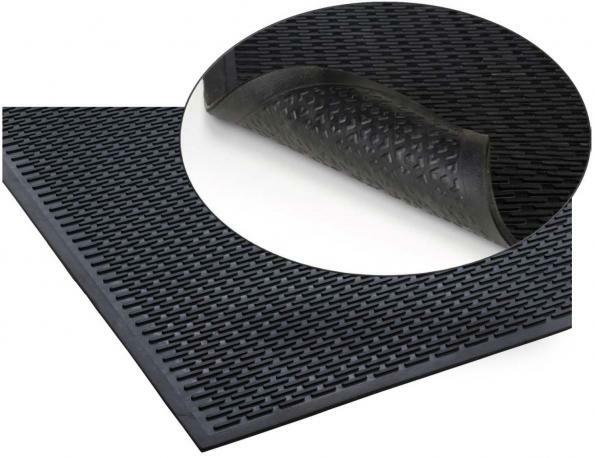 With its excellent scraping action, the Sure Scrape mat provides a cleaner environment for entryways and hallways. This mat also helps prevent slips and falls by providing traction in wet areas, contributing to the safety of your customers and employees. Due to its low profile there is no interference when opening or closing doors, making it an ideal choice for any entryway. Cleaning is a breeze! Simply shake the mat out, rinse with hose, and let dry. Due to its superior construction, this mat will also stand up to industrial washing. Also available in 100% Nitrile, by special order only.